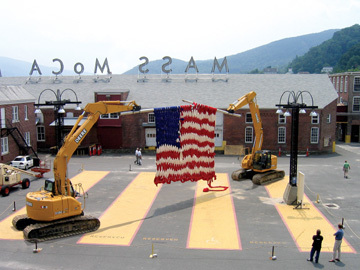 I happened to be at Mass MoCA at the start of July 2005 when Providence sculptor Dave Cole lead a team driving excavators that knit a 30-by-20-foot American flag using utility poles as needles. Cole has said that when he first performed “The Knitting Machine” in Providence to mark the first anniversary of the Sept. 11 attacks it was about “the relationship between place, art, and nationalism” and when I saw it at Mass MoCA it was about “nationalism, internationalism, and colonization.” To me, the point seemed to be how to make America whole after the terrorist attacks while also critiquing American imperial dominance via our big manly machines by conscripting them for “women’s work,” or something like that. 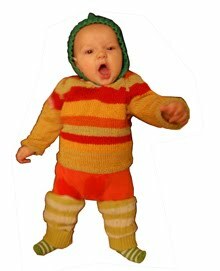 Cole is a wry conceptualist. He knit a 14-foot-tall pink teddy bear out of soft, prickly fiberglass insulation for the 2003 DeCordova Annual, probably his most accomplished and, despite its scale, subtle work – a complex rumination on cuddliness and warmth and poison and menace, or the toxic trade offs we’re willing to make for security as individuals, and as societies. And there were compelling ideas in “Knitting Machine,” too, but I had trouble giving myself over to the Mass MoCA project because I couldn’t help feeling that mostly Cole was getting off on playing with big macho machines -- which seemed to undermine what he was talking about. 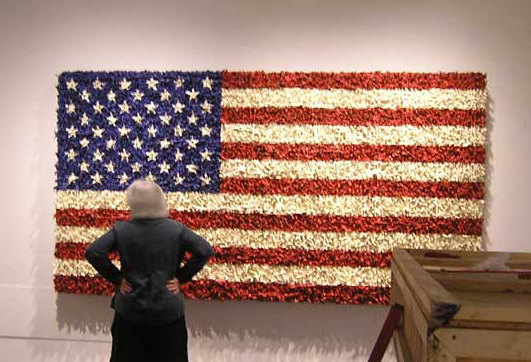 Now Cole presents “Memorial Flag,” a small exhibit of flag works and faux Native American wear, at the Danforth Museum in Framingham through Dec. 23. Cole noticed that 19th century Native Americans made breast plates from beads manufactured by the white society that was trying to exterminate them. So to drive home this observation, he recreated Arapaho, Brule and Caddo breastplates with bullet casings and rubber and lead fringe. 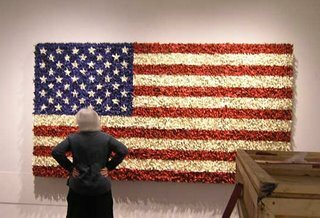 His “American Flag (Toy Soldiers)” and “Memorial Flag” feature hundreds of plastic soldiers glued together to form rectangles and painted red, white and blue like American flags. Cole’s work is often pretty didactic, so you can trust he’s saying something here about the flag representing all the blood and bullets spilled in our nation’s rebellions and conflicts and conquests. 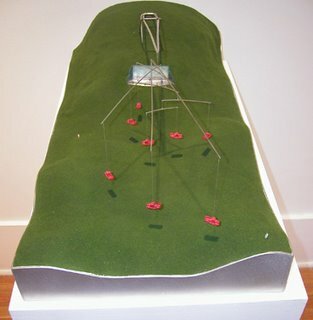 At Judi Rotenberg Gallery in September, along with some of these flags and breastplates, he exhibited “Trophy Wife” sculptures made from found dressmakers’ dummies lovingly shellacked and topped with racks of antlers (punch line: nice rack) to say something about ladies’ bodies as trophies for men. “The Money Dress,” a thousand shredded dollar bills knit together in the pattern of a Vera Wang evening gown, seems to replicate what it’s talking about -- something about high fashion flaunting wealth – rather than critique it. Cole chooses important subjects, and his pieces are finely crafted, but is any of this war-gender-wealth stuff news? He’s clearly a talented guy with the potential to make great art when his ideas and delivery are a bit more nuanced and complex, when he insinuates his themes rather than clunking you over the head with stuff you already know. 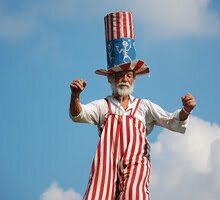 I’m not sure what to make of his latest scheme, a plan to erect a mobile of old pickups taller than the Statue of Liberty. It seems a monument to the ludicrousness of our car-petroleum culture. 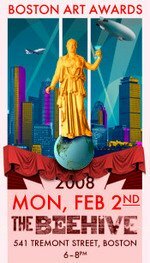 The poster, model and macquette for the “Truck Mobile” that he showed at Rotenberg were slickly done – and I think this prep work to embody the idea is the point, rather than actually ever building it. It’s a send up of such grandiose projects. I hope. 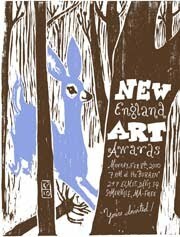 Dave Cole at Danforth Museum of Art, 123 Union Ave., Framingham, Sept. 10 to Dec. 23, 2006.